The Mission of the Cresco Area Chamber of Commerce is to develop and grow new and existing businesses, promote community involvement and to encourage business alliances. The Cresco Area Chamber of Commerce is a membership based non-profit business that promotes its members first and foremost. 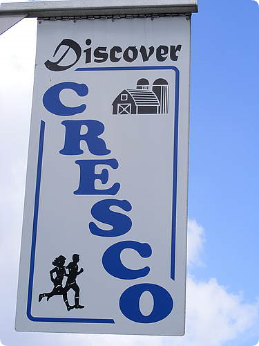 Cresco is "Iowa's Year Round Playground" and it is the Cresco Area Chamber of Commerce's responsibility to promote Cresco and our excellent quality of life. We assist in helping existing businesses grow and expand and new businesses get started with their ideas. We are a resource for visitors, tourists, new residents, established residents, non profit organizations and groups, entrepreneurs and the entire Cresco Community. Think of us as your "Information & Resource Booth" for the community of Cresco. Our membership consists of almost 200 businesses, individuals and non-profit organizations around the Cresco area. Their dollars are invested back into the community to make our local economy strong. ​We remind you to Shop Small, Shop Cresco! Go to our business directory to see a complete list of the proud members that are giving back to their community. ​Membership is open to any person, association, corporation, partnership or trust interested in the commercial, industrial and civic progress of Cresco and Northeast Iowa.